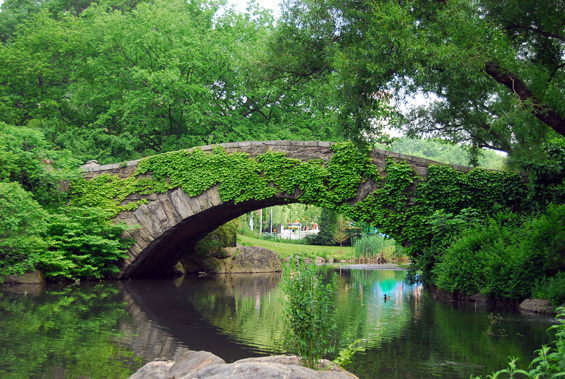 Gapstow Bridge is one of the icons of Central Park, Manhattan in New York City. The first bridge was designed by Jacob Wrey Mould in 1874. The bridge was a wooden bridge with intricate cast iron railings. Due to excessive tear and wear, it was replaced by the present simple stone structure in 1896, by Howard & Caudwell. The schist stone span curves over the narrow neck of The Pond. Facing south, it offers a view of the city, the Plaza Hotel and other buildings. Gapstow stands 12 feet high, spans 44 feet of water, and stretches 76 feet in its full length. During the warm weather green foliage will cover the bridge. 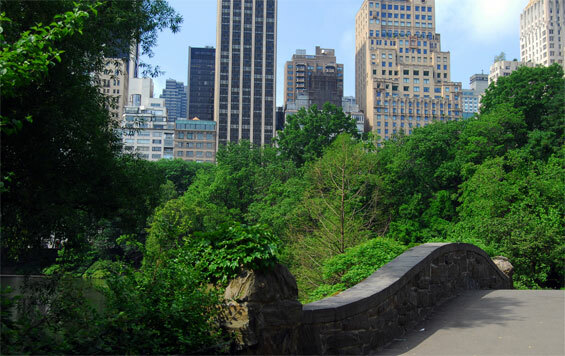 It is most accessible by entering the Park at the corner of Central Park South and Fifth Avenue and following the path that runs to the right counter-clockwise along the perimeter of the Pond.